When you first start out on your Nerf journey, you are most likely going to start off by using spring-loaded guns that are simple to operate and give you just enough firepower to compete with other players who are in a similar part of their journey. Over time, however, you are probably going to feel the desire to upgrade to guns that are faster, stronger, and more capable of providing the ammunition you need to compete with those who are farther along their Nerf path. Typically, the guns that are going to meet these requirements are going to be battery powered but it is important that you don’t just choose any battery blaster as some could be more trouble than their worth if they don’t function as promised. To make sure that you avoid this issue, we have put together a list of the 9 best battery powered Nerf guns that will allow you to improve your Nerf game. 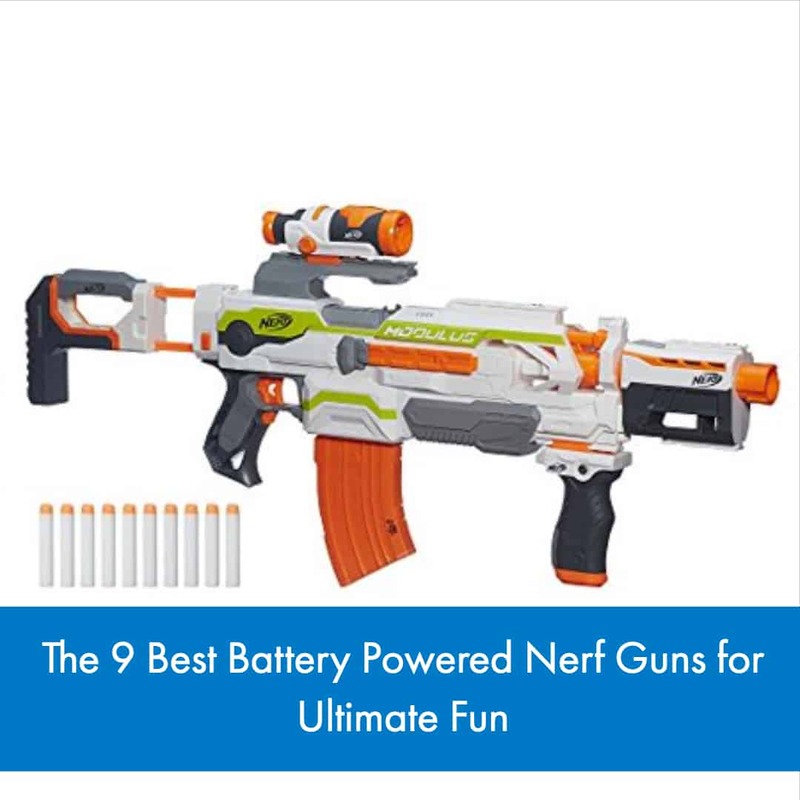 Let’s take a look at these excellent battery powered Nerf products! Nerf handguns are easy to operate without having to keep both hands on the weapon and are generally more lightweight than some of the other battery powered products offered by Nerf. However, these types of blasters tend to be less available due to the fact that battery power is often reserved for larger blasters. Here are a few of the battery powered Nerf guns that are currently on the market. 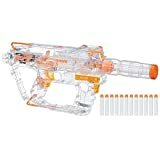 The Nerf N-Strike Elite Stryfe blaster is always making the cut when it comes to lists that cover semi-automatic blasters. Why? Well, the Nerf N-Strike Elite Stryfe blaster is one of the few electronic handguns that Nerf produces and it is also an extremely useful weapon in battle. The Nerf N-Strike Elite Stryfe blaster is a motorized handgun that utilizes a six-dart clip system in order to fire darts towards targets up to 90 feet away from the user. Because it is a handgun, it is rather easy to use, only requiring the user to hold down on the acceleration button to fire darts. 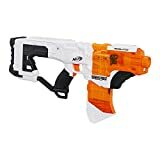 The overall design matches the theme of most Nerf guns and features a bright orange body with a dark grey grip that displays the gun’s name and a white stripe running along the body of the gun that also advertises the blaster’s name. The best part of this blaster is the fact that it can be used with larger clip systems so that you won’t have to run out of bullets as fast as you would when using the regular six-dart clip. This blaster also allows you to operate it with only one hand, giving you the ability to hold one in each hand and improve your chances of hitting your opponents. However, this gun is not without issues. One of the biggest issues that users have with this blaster is that it is prone to jamming, which is a common issue with most battery powered blasters. You can prevent this from happening as often by making sure that you load the ammo into the clip properly and load the clip into the blaster properly. Overall, the Nerf N-Strike Elite Stryfe blaster is one of the first blasters that users should consider when they are looking for a battery powered Nerf gun. Although it may seem like a bit of a stretch to some, the Nerf N-Strike Modulus ECS-10 blaster was put into the handgun category because, stripped of its accessories, the blaster itself is able to be held and fired with only one hand. 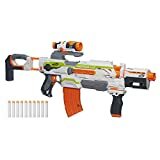 Pushing past the issue of where the Nerf N-Strike Modulus ECS-10 blaster should be placed on this list, the blaster itself is an attractive piece with a white and green body designed to look like a futuristic technological weapon. This semi-automatic blaster comes with three accessories to help you start customizing and building up your Modulus accessory collection: a drop grip, a targeting scope, and a dual rail barrel. Besides these additional pieces, the blaster comes with a banana clip that is capable of holding up to 10 darts that, once unleashed, can hit targets up to 90 feet away. For those who are big into customization, the Nerf N-Strike Modulus ECS-10 blaster is the perfect choice as the entire Modulus series offer a variety of different accessories that give you 30 different blaster setups to choose from. Besides the occasional jam that occurs during use, the Nerf N-Strike Modulus ECS-10 is an excellent blaster that will give you the ability to wield the most versatile weapon on any Nerf battlefield. 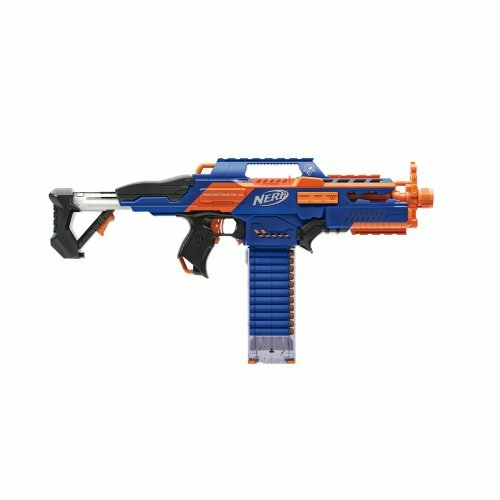 Although we try to stray away from adding multiple blasters from the same line into our lists, the Nerf N-Strike Modulus Regulator Blaster was simply too good to pass up. Like the previous Modulus model, the Nerf N-Strike Modulus Regulator blaster becomes an amazing assault rifle when it is fully assembled with all of its provided accessories. However, in its basic form, this blaster is truly an easy-to-wield handgun. This Nerf gun reverts back to the traditional Nerf colors with a white, blue, and orange body, featuring additions such as a long barrel scope, a short barrel scope, a swivel handle to help stabilize the weapon when it is in its longer form, and a storage stock that is capable of holding additional clips. Speaking of clips, this Modulus model upgrades ammo storage by providing clips that are able to hold 12 bullets and special feature that blinks when you have run out of ammo in your clip. However, the best feature is yet to come. What truly separates this blaster from every other one on this list is that it is both a semi-automatic blaster as well as a fully automatic blaster. How does it achieve this? On the gun, there is a switch that allows you to choose between single fire, burst-fire, and continuous fire. Although this blaster is listed in the handgun section, this is a highly-recommended blaster that can give you anything you ever wanted, regardless of what type of gun you are on the hunt for. Our next section is going to cover larger battery powered blasters that would fall into the assault rifle category and are perfect for primary weapons during a Nerf war. These selections will both be semi-automatic and fully automatic and we will list what type they are when we describe each choice. Our first selection is often compared to the Stryfe due to the fact that it works in a similar manner to the handgun blaster but with improved functionality and better features, according to most users. This blaster also features a transparent section on the front of the gun that reveals the firing mechanism and a small portion at the top of the ammo clip that lets you see how many bullets you have remaining. These clips can hold up to 10 darts and fire darts at targets up to 60 feet. 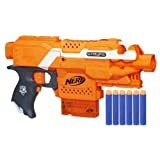 While this Nerf product doesn’t have much to offer in terms of additional features or looks, it is a great blaster that functions as promised and gives you the firepower you need to successfully attack your enemies. There are always those players that you just want to blast to smithereens. However, hitting them with a barrage of bullets isn’t always satisfying enough to curb this desire. What will, however, is hitting them with a giant missile. With the Nerf N-Strike Elite 2-in-1 Demolisher blaster, this is made more than possible! Although this blaster is often overlooked, it is more than capable of performing like other blasters of similar nature. 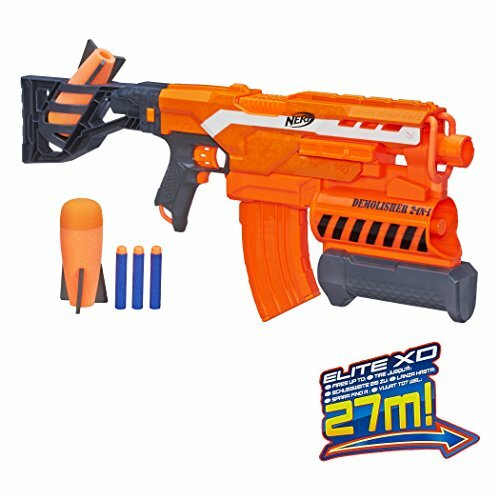 The Nerf N-Strike Elite 2-in-1 Demolisher blaster is a semi-automatic Nerf gun that gives you the ability to shoot regular bullets and missiles at the same time. 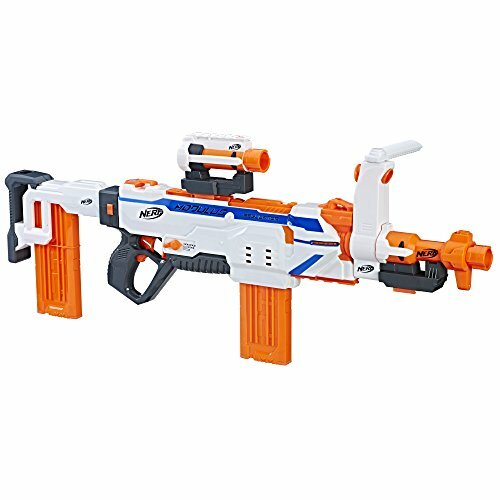 The major portion of the gun, which is the dart blaster, features a bright orange body that comes with a shoulder stock that doubles as missile storage, a banana clip system that can hold 10 darts and fire them up to 90 feet, and a smaller blaster on the front end, which is the missile blaster. The missile blaster is capable of holding one missile at a time and uses pump-action to launch missiles at enemies up to 90 feet away as well. However, this feature is entirely optional and doesn’t need to be used in order for the gun to function. If you have that one person who needs to be taught a lesson, don’t stop at semi-automatic firing. Dominate them with the Nerf N-Strike Elite 2-in-1 Demolisher blaster! Some weapons are perfect blasters for war. Others are stunning pieces of art that capture the attention of everyone on the battlefield. Then, there are those that manage to embody both of thes qualities such as the Nerf N-Strike Elite Rapidstrike CS-18 blaster. The Nerf N-Strike Elite Rapidstrike CS-18 blaster is a fully automatic Nerf gun that has a sleek orange and blue design that makes it a powerful and desirable weapon. This blaster features a transparent clips sytem that allows you to keep tabs on your available ammo and holds up to 18 darts, a shoulder stock that helps to improve accuracy and stabilize your weapon when it is rapid firing, and can reach targets up to 75 feet away. Even more impressive, this fully automatic blaster can manage to shoot up to 3 bullets per second. However, this means that it will require a lot of battery power and will run out of bullets rather quickly, which can be disadvantages for some users. Still, the Nerf N-Strike Elite Rapidstrike CS-18 blaster is a great Nerf blaster for those who are in need of a fully automatic, primary weapon and who also want a piece that looks as good as it functions. For the last product on this section, we decided on the semi-automatic Nerf N-Strike Modulus Ghost Ops Evader blaster. With a body as unique as it’s name, the plastic that makes up this device is completely transparent, making for a see through blaster that reveals all the working mechanisms contained within. Along with the transparent body, there is a lighting system contained within the blaster that helps to illuminate dark areas when you are in playing in Nerf battles that are hosted at night or when you are in dark inside spaces. Besides the awesome glowing feature, the Nerf N-Strike Modulus Ghost Ops Evader blaster comes with a long barrel extension, a 12-dart clip system that is also transparent and makes it easier for you to reload and keep track of your current bullet count, and an additional barrel that measures dart velocity and keeps count of how many shots you have fired. Because this is part of the Modulus series, this blaster is also highly customizable, making it a desirable option for those who want a gun that can work in any battle situation. Overall, the Nerf N-Strike Modulus Ghost Ops Evader blaster is another versatile yet unique option for the serious Nerf enthusiast. While we did list unique products in the previous seven mentions, there are other blasters that deviate from the norm that also need batteries in order to operate. For our next two suggestions, we are going to talk about these products. The Nerf Rival series is a special series that is geared towards older Nerf enthusiasts and especially towards those who are looking to have more serious and more accurate Nerf battles. These next two suggestions will come from that line and the first one we suggest is the Nerf Rival Khaos MXVI-4000 blaster. 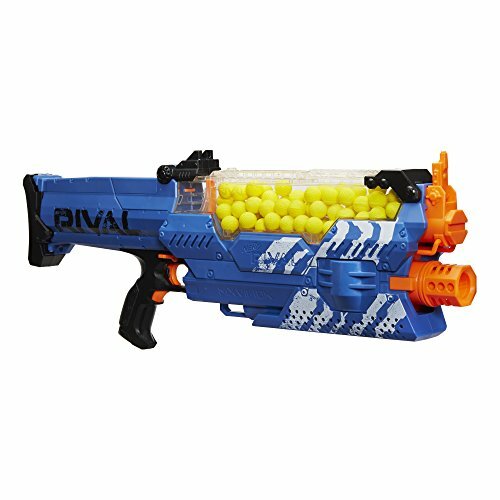 The Nerf Rival Khaos MXVI-4000 blaster is a fully automatic blaster that utilizes high-impact foam ball rounds in place of the traditional foam darts that Nerf is so well-known for. These high-impact rounds are much more accurate and are capable of traveling at speeds of 100 feet per second. This blaster, which comes in blue or red for the different teams that users have when engaging in Nerf Rival battles, is capable of holding up to 40 high-impact foam ball rounds and uses a transparent magazine system that holds four lines of ten high-impact rounds in order to do so. The power is all held in the action and there are not many extra features that come with this blaster. The blaster itself is rather large and takes several large batteries in order to function properly, which may be a problem with smaller Nerf players who aren’t capable of managing larger guns throughout the duration of a Nerf war. For those who are, however, the Nerf Rival Khaos MXVI-4000 blaster is a powerful, fully automatic blaster that will take down tons of enemies in one fell swoop. 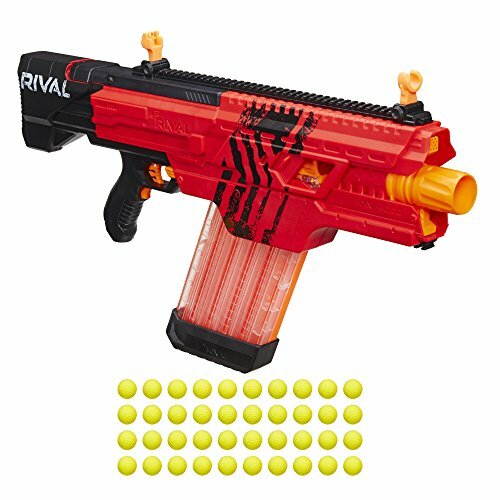 Yet another fully automatic selection from the Nerf Rival series, the Nerf Rival Nemesis MXVII-10K is even stronger than the Nerf Rival Khaos MXVI-4000. 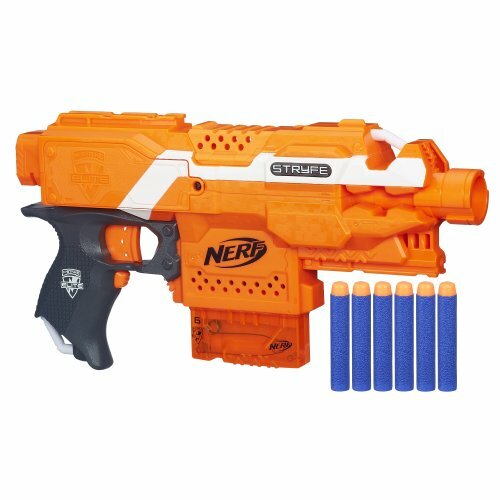 The Nerf Rival Nemesis MXVII blaster features top loading capabilities and can handle an impressive 100 high-impact rounds rather than the 40 high-impact rounds that are previous suggestion was capable of storing. While this blaster carries the same burdens and advantages that the previous blaster experienced, this blaster comes more highly recommended than the previous one due to the fact that it is much simpler to load through the top rather than having to flip the gun upside down in order to load the magazine like you do with the Nerf Rival Khaos MXVI-4000 blaster. If the previous blaster was not enough for you, the Nerf Rival Nemesis MXVII-10K blaster will certainly do the trick.